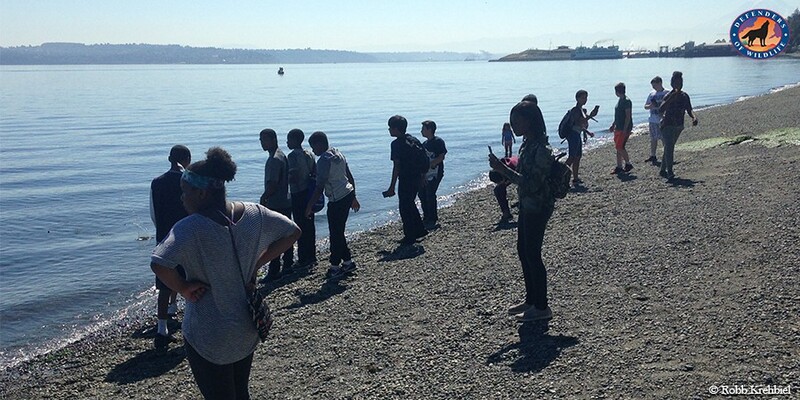 In July, we spent two days in Tacoma with a group of students from Baker Middle School talking about orcas, raingardens, and what these students can do to at their school to protect our local ecosystem and its wildlife. Visits to schools like this one highlight the impact that pollution has on both orcas and salmon, and the role that raingardens play in helping protect both species and their habitat. Baker Middle School is one of the schools that enrolled in OLR. With three raingardens on their property, we have been working with maintenance staff to develop plans to improve these raingardens. We’ve also been working with one of the school’s science teachers to connect his students more with these raingardens. To do that, he invited members of the Orcas Love Raingardens steering committee to talk to his students about the program this summer. 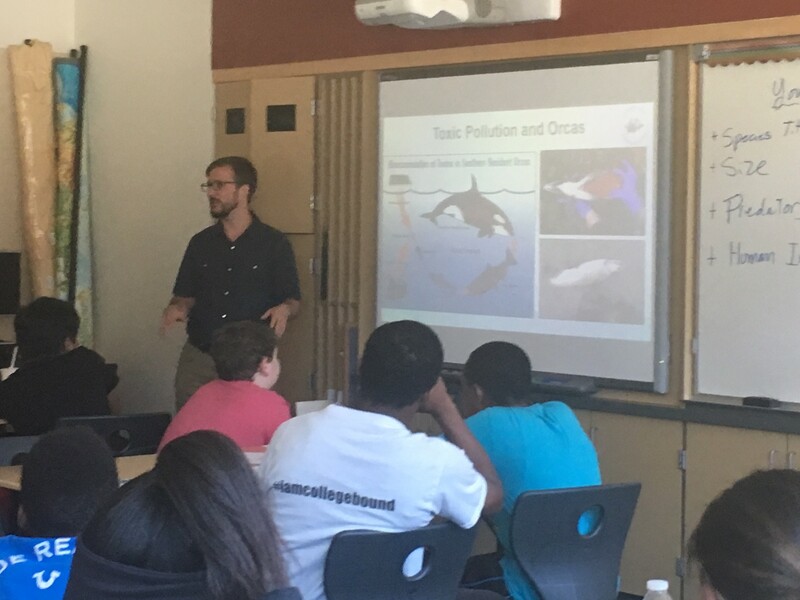 Robb from Defenders of Wildlife discusses orca biology with the Baker MS students in their classroom. Before we got to the classroom, the students had been learning about endangered species, and they each created posters on endangered marine species. One of the big questions they were exploring in class was “How does what we do on land help and/or hurt marine wildlife?” To help answer this question, the teacher invited us to come and talk to the students about Orcas Love Raingardens! We talked about orca biology, the impacts of stormwater, and the benefits of raingardens. After our talk, we went outside to visit the three raingardens on Baker’s property. Sadly, all three of Baker’s raingardens need maintenance updates. The soils are too sandy, weeds have started invading, and many of the desired plants have died off. We talked to the students about some of these problems and asked them for ideas they had about ways to improve them. During the next school year, students will be researching different plants that do well in raingardens and helping us determine which ones to plant. It was exciting to watch students talk to each other about ways to make the raingardens look nicer and work better. Some started pointing out weeds that needed to be removed! To help them learn a little more about raingardens, we took the students to Point Defiance Park the next day. Point Defiance is one of the largest city parks in the country, and it’s home to the Point Defiance Stormwater Treatment Facility. This system is basically a big raingarden, capturing most of the stormwater runoff flowing out of North Tacoma before it enters Commencement Bay. This is the world’s largest raingarden! Jessica Knickerbocker, an environmental engineer with the city, gave a tour of the facility and answered the students’ questions about how it works. This tour generated some great ideas among students for things they could do back at their school. After that, we went down to Owen’s Beach, a popular spot in the park, to walk along the shore and explore tidepools. 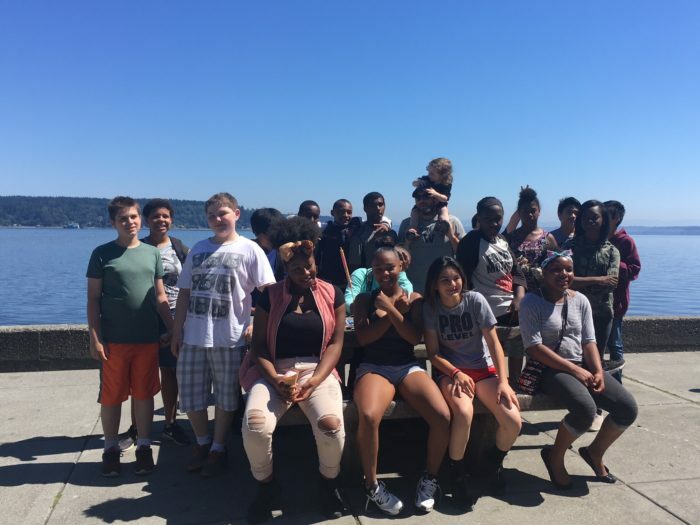 While Baker Middle School is only about 10 miles from Point Defiance, this was the first time that many of the students had been to the park. Many of these same students had never walked along the shores of the Salish Sea or touched it waters. Baker is in a lower-income neighborhood, with three quarters of the school’s students qualifying for free or reduced lunches. 75% of the school’s student body is made up of students of color. This matters because students of color face a disproportionately large barrier in accessing the outdoors compared to students living in Tacoma’s wealthier white communities. Because of this, this field trip was a high priority for OLR, and seeing how much the students learned and enjoyed the trip was very rewarding. As we walked along the beach, we pointed out kelp and sea grasses that had washed ashore and talked about how important they are to salmon. Under the docks, we found giant crabs and watched clams spit into the air as we walked along the tide flats. We also saw a great blue heron hunting for fish along the shoreline! Students were running between tidepools, collecting shells, and pointing out different species they saw. Throughout the trip, we talked about how the raingardens on the Baker Middle School property are connected to Point Defiance and orcas. Baker is in the Flett Creek Watershed, which drains into Commencement Bay. The mouth of the Puyallup River is at the base of Commencement Bay. The Puyallup and its largest tributary, the White River, support two of the largest wild Chinook salmon runs left in Puget Sound. Orcas have been seen in Tacoma feeding on these salmon. 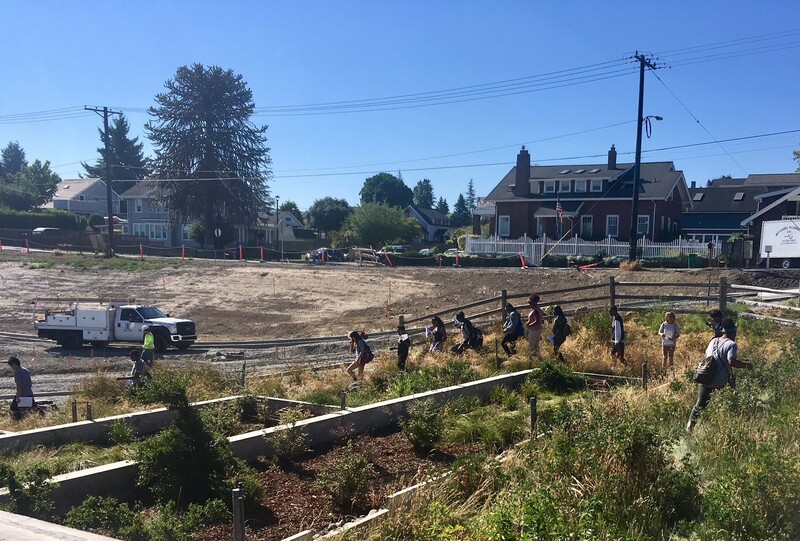 By treating stormwater at Baker Middle School, these students can improve salmon habitat for these important runs. And with less stormwater runoff, these salmon will accumulate fewer toxic chemicals, which will help keep orcas healthy. We’re looking forward to working with Baker Middle School and its enthusiastic students to improve the school’s raingardens and protect orcas!